JISC’s vision is one of easy and widespread access to information and resources, anytime, anywhere; a vision with technology and information management at the heart of research and education. all projects associated with this implementation plan need to have sustainability built in from the start. We want to ensure aggregations are maintained and not produced and then orphaned. We will be requiring a commitment from each project in terms of sustainability. There is a broader issue of sustainability for institutions providing metadata to aggregations. This issue will need to be considered during the period the implementation plan covers. Consultation and effective partnerships are essential to successfully achieving the resource discovery taskforce vision. The people listed below are the key stakeholders in this work. Other relevant content aggregations. E.g. The resource discovery taskforce has now completed. Members will continue to be part of a mailing list and will receive updates about the resource discovery work on a regular basis. Members will be invited to two review meetings to monitor and advise on progress to the vision. These review meetings are provisionally scheduled for April 2011 and February 2012. A key part of the implementation plan is the creation of a framework to manage the aggregations and their sustainability. Details of the governance of the framework will be described elsewhere and linked to from this implementation plan. Governance beyond the 2012 time period discussed in the vision will be managed as part of the framework. Risk will be managed as part of the framework that will manage the aggregations. This will need to be a carefully managed piece of work that will continue to develop alongside the development of the framework. The risk register will need to be developed in consultation with relevant parties. JISC will maintain a separate risk register to cover the work that JISC funds. This risk register will form part of the JISC programme documentation. Risk will also be addressed as part of the stakeholder management effort. While the resource discovery taskforce vision is about the aggregation of metadata about collections the implementation plan needs to promote and encourage the development of the key services that can be built or enhanced using the aggregated metadata. An early output of the implementation plan will focus on describing these services for use in communication and planning. The results will be recorded in the implementation plan, the resource discovery taskforce blog and anywhere else that makes sense. When services are developed they will also be recorded in this implementation plan. The rdtf blog will be used for these monitoring and tracking tasks. Particularly important information will be added to the implementation plan. 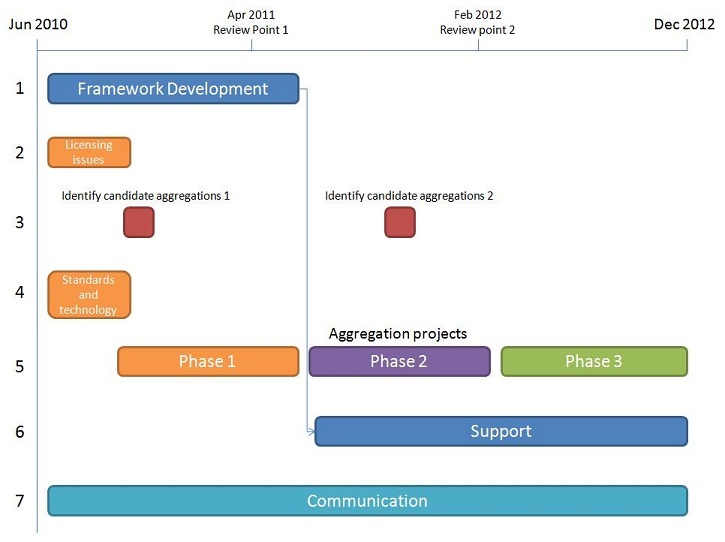 The rdtf blog: https://rdtf.jiscinvolve.org contains a description of the work that led to the resource discovery taskforce vision and the context that informed the vision. It will also be used to communicate updates on the progress to achieve the vision.